Batman: The Animated Series' 5 Most Hopeful Episodes | Nerd Much? Last week was rough. I keep reading about friends and strangers alike across this nation who are terrified about the future of the country — about being the victims of validated acts of hate and violation. Given all we’ve seen in the past months, I don’t think they’re overreacting. We’re headed into dark times but hope and inspiration can be found in the strangest of places. For me, I rediscovered it in Batman: The Animated Series. Since childhood, B:TAS has been my favorite show ever. It was massively entertaining for me as a kid and has aged spectacularly thanks to iconic vocal performances, strong writing, and a respectful and mature approach. There may be no better adaptation of the Dark Knight out there. It’s also dark as midnight and has provided more tragic episodes that have thrown me into a soulful pool of depression than I care to admit. But while the series usually explores a bittersweet, downright sorrowful or darkly triumphant tale, there are some select episodes that excel at showing optimism. These episodes showed that in the face of overwhelming darkness, a little hope can shine through even brighter. This episode sees Batman intervening in a gang war between mob boss Rupert Thorne and his aging rival Arnold Stromwell. It’s one of those surprise episodes that was never one of your favorites as a kid because it doesn’t have the flashy supervillains but completely gobsmacks you as an adult. Batman isn’t out to simply take down Gotham’s criminal element here, and is instead actively working to give Stromwell some redemption before he ends up dead. Instead of your hallmark enhanced interrogation, Batman takes Stromwell to see his missing son … in a drug rehab facility. Three guesses whose group he got the drugs from. Stromwell doesn’t give up easy though, and it’s only after an emotional reunion with his brother at the site of a childhood accident that he commits to changing his ways. This early Batman adventure stands out even more today for a) openly depicting the emotional toll of drug abuse in a ’90s kids show and b) showing us a more benevolent side of Batman. As the title suggests, “It’s Never Too Late” tells an effective story of how, even after a lifetime of bad choices and pain inflicted, there’s always a path to redemption. It just takes the support of those who are closest to us to make it happen. 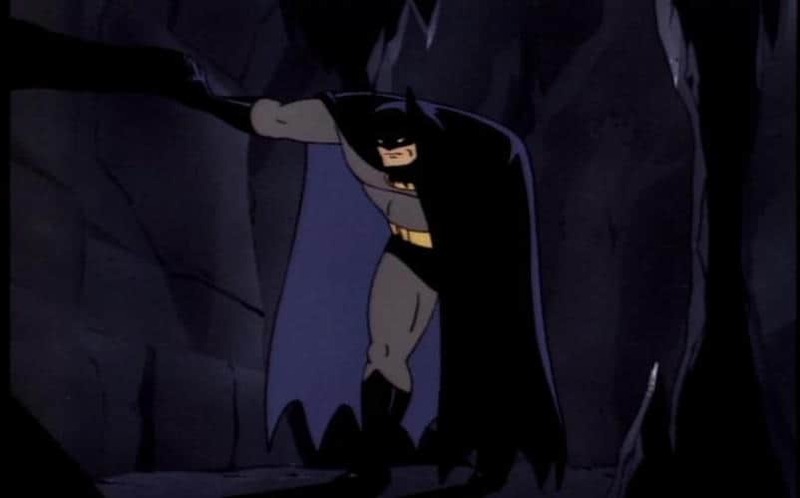 This episode follows Batman tracking a mysterious bomber hitting Gotham and the curious connection between the attacks and Bruce Wayne’s favorite childhood show, The Gray Ghost. 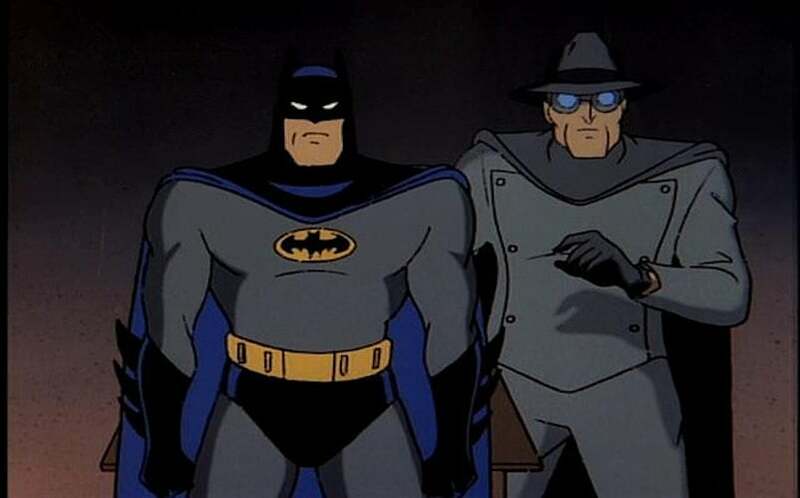 His investigation draws in Simon Trent (voiced by Adam West), the washed up actor who starred as the Gray Ghost, as the two try to piece the case together. There are heavy shades of disillusionment at play, as we see Trent’s life has only gotten more sad and lonely since the days of starring in the show. His hero’s complete unwillingness to help initially has Batman let down as well. Long story short, Trent teams up with Batman to stop the mad bomber, who turns out to be a toy collector (voiced by Bruce Timm himself) who’s holding the city for ransom to … buy more toys. Not the most compelling adversary this show produced, admittedly. But that’s not what makes the episode great. What does, is watching the flashbacks of young Bruce watching the show in wide-eyed wonder, then with the same look of being transported back as he visits it as an adult. We see the early seeds of who Bruce will become being planted and know that, even though Trent went through some rough times, the role he played went on to inspire something good in the future generations. 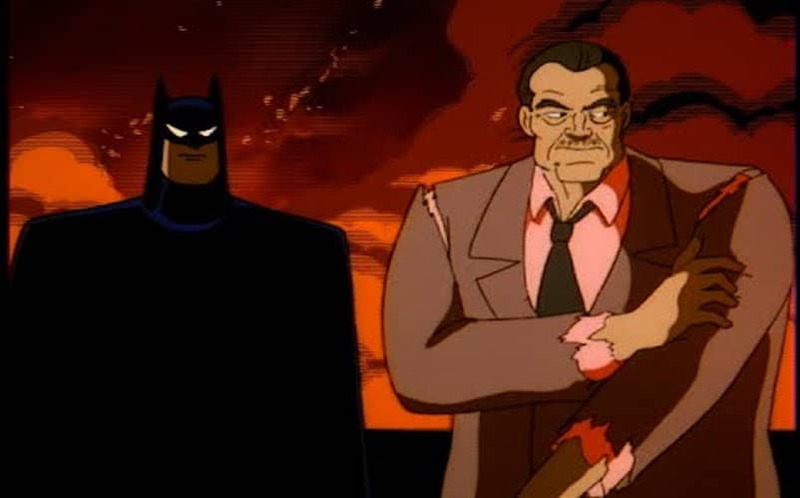 “Two-Face” has got to be one of the most devastating episodes of BTAS. Harvey Dent’s fall from grace into Two-Face rivals that of Mr. Freeze in terms of sheer tragedy. After being blackmailed and disfigured in the previous episode, Harvey Two-Face goes on a streak of vengeance against his tormentor, Rupert Thorne, while Batman experiences some intense guilt-driven nightmares over not saving his friend. 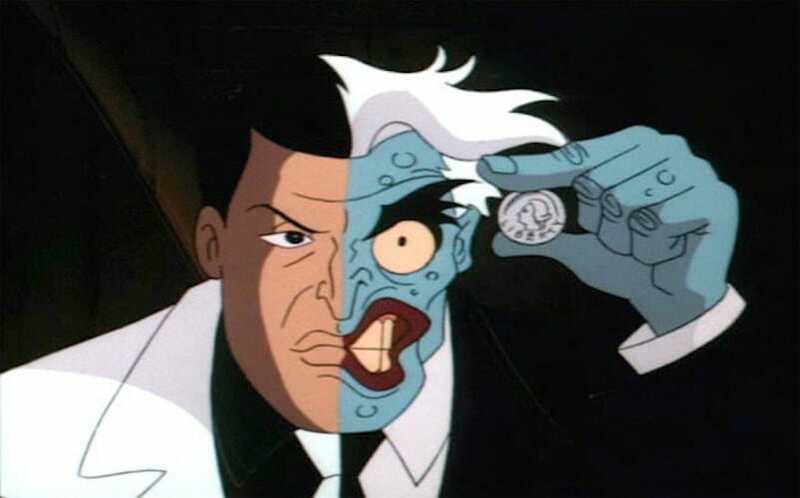 By the end, Batman makes the tough choice to save Thorne by disorienting Two-Face mid-coin-flip with a box of silver dollars, leaving him unable to find his coin and sending him into a full mental breakdown. Two-Face is put into custody, while Commission Gordon and Batman lament Harvey’s fate. Batman walks over to a nearby fountain as perhaps the most seminal musical cue of the show, outside of the theme, comes in. “But a little luck wouldn’t hurt,” Batman says as he reveals Harvey’s missing coin. “For you, Harvey,” he says as he flips it into the pond and walks away. We see it reach the bottom and land on the unscarred side, signaling that, no matter how bad things get, there’s some hope going forward. Tear ducts successfully drained. Two-Face isn’t the only villain struggling with a split personality in this show. Arnold Wesker, aka The Ventriloquist, has been a punching bag for his gangster personality Scarface – his ventriloquist’s dummy — since the beginning. When we first pick up with Wesker in the revamped New Batman Adventures, he’s a reformed man. Six months rehabilitated in Arkham, and a new home and job waiting once he’s released, courtesy of Bruce Wayne. But the ghosts of the past are soon back to tormenting Arnold and he may not be strong enough to resist. “Double Talk” has a lot going for it. Crazy dream sequences, a benevolent Batman intent on helping his old adversaries after healing, reality blurring, and a ridiculous chase scene involving someone impersonating the dummy. More so, it actually sees Wesker overcoming Scarface’s influence, choosing instead to unload a few machine gun rounds into the dummy before it falls into a cooling unit fan, promptly getting shredded into dust. 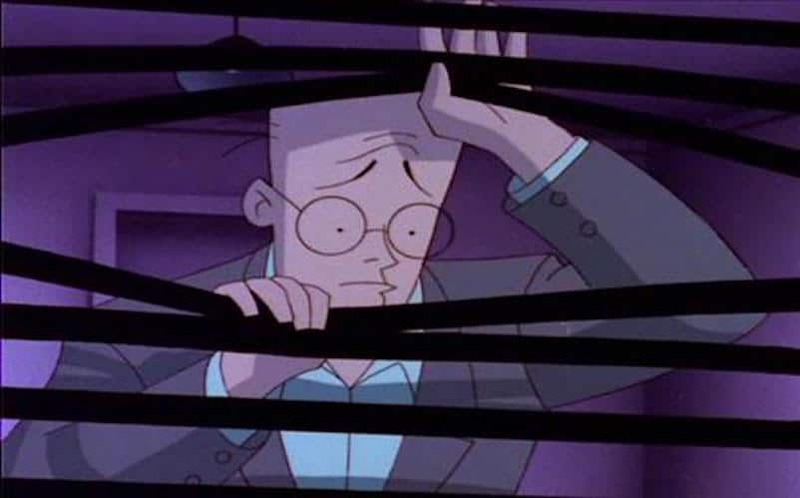 By the end of the episode, Wesker is completely freed of the baggage of his past, and goes on to become one of the few Batman villains to reform and stay that way. Holy doubt, Batman. 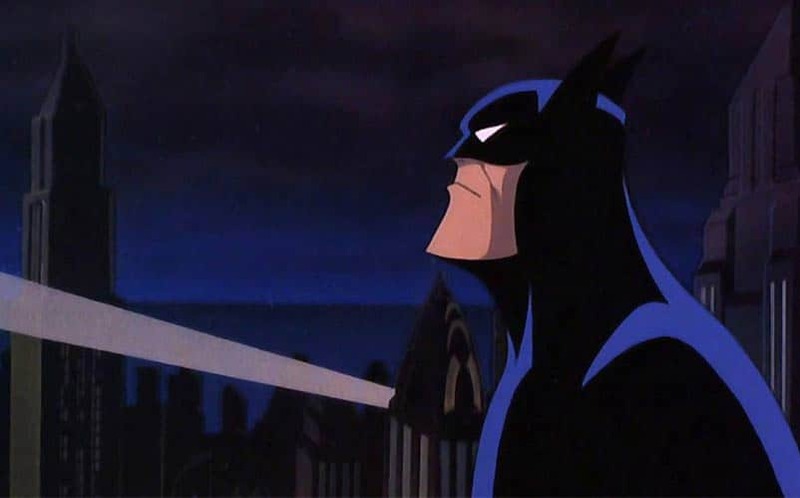 “I Am the Night” sees Batman at one of his lowest points in the series. At a time when he’s already questioning the good he’s doing for the city, Commission Gordon is gravely injured under his watch, leading to an epic meltdown in the Batcave. Batman is able to thwart a repeated attempt on Gordon’s life, but only after a bout of deep soul searching and the support of Alfred and Robin to pull him back from the abyss. Most of us have been in a place of frustration and doubt with ourselves and where we think we’re headed in life. Here we’re reminded that sometimes all it takes is a support system and some small victories to get us to keep forging ahead. For Batman, it was seeing a young punk he saved early in the episode go on to thank Batman for setting him on the right track. There may be no end in sight to the war but the small victories are what keep us going.